On a whim, we took the High Speed Rail to Tainan and spent the night. We visited Chihkan Tower. 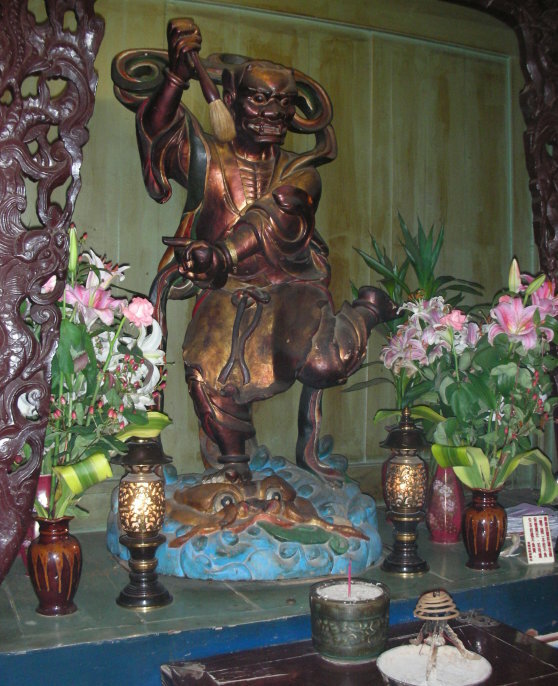 On the site is a statue of Kui-Xing, believed by some to be a servant deity of a “God of Literature” named Wen-Chang. 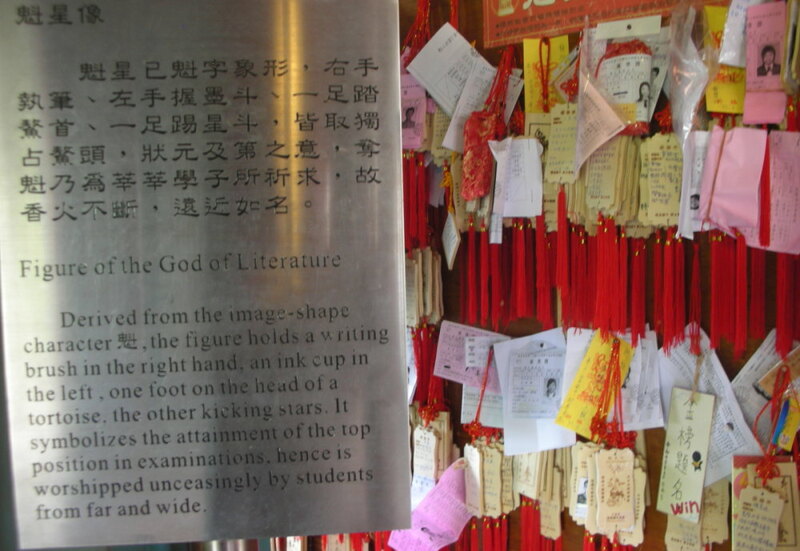 By the statue were many of what appeared to be student identity cards hanging near a sign that explained the motivation of those who worship (click to enlarge and read). While we observed the surroundings, a young gentleman walked in and faced the statue. With his hands together and head prostrated, he muttered with intensity. He then gazed at the sculpture with a hint of desperate hope and left. 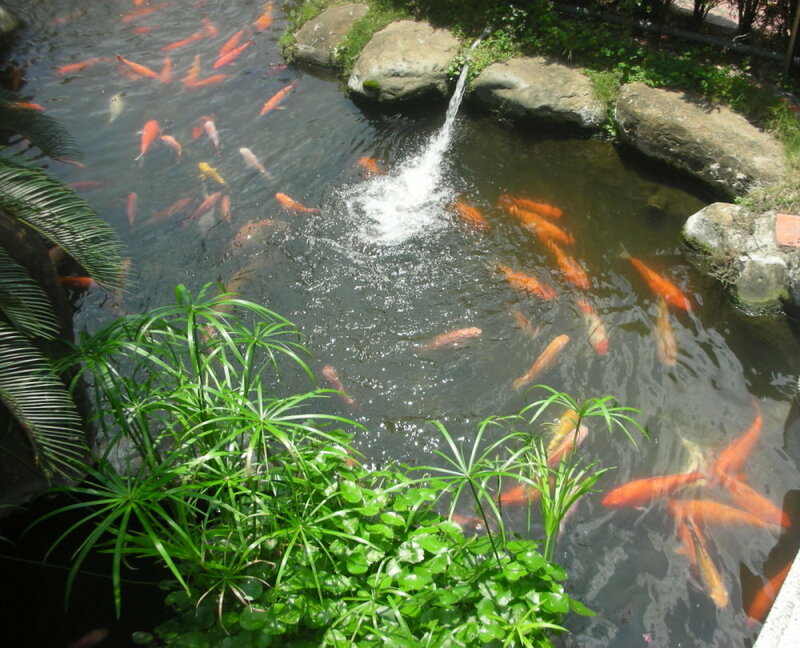 Elsewhere on site, a shoal competed for food human visitors paid 10NT for to toss into the human-made pool. The word god is for me nothing more than the expression and product of human weaknesses, the Bible a collection of honourable, but still primitive legends which are nevertheless pretty childish. For me the Jewish religion like all others is an incarnation of the most childish superstitions. And the Jewish people to whom I gladly belong and with whose mentality I have a deep affinity have no different quality for me than all other people. As far as my experience goes, they are no better than other human groups, although they are protected from the worst cancers by a lack of power. Otherwise I cannot see anything ‘chosen’ about them. I relate to and consider Einstein’s “cosmic religious feeling” (see article) sensible. It’s a tremendous fact that we’re connected to all that is, ever was, and ever will be (how can it be otherwise?). This fact alone is more than enough impetus to give serious consideration toward the question of living morally. It’s sane and sensible to deny the outrageous idea that any particular group of people are “chosen” by a personal “god” to play a privileged role in human history. Such nonsense, like other childish religious beliefs, can only stir trouble. The more you try to get to know Him, the more you realize He is a mirage. Any parent who has watched a child spontaneously learn to read must question mechanistic theories of human development that oversimplify complex issues. Thinking of my own child, I couldn’t agree more. Stager offers colorful commentary on the results of the NCLB Act’s Reading First program while cutting through the spin here. A recent dialog with another got me thinking to write as clear a statement as I could on two issues: abortion and capital punishment. 1) An abortion isn’t necessarily morally wrong. If the case is that the fetus is unwanted, it should be destroyed as soon as it is safely possible. That is, before it is born and becomes a person. 2) Death penalties are unethical because they are the premeditated execution of an incarcerated person. Killing a person under such circumstances is wrong because that person (presumably) wants to live. Hey, that’s me he’s talking about! If people want to make jokes about inconsistencies, a better example would be those who don’t mind [legalizing] the [early term] crushing and dismemberment of innocent human beings (without anesthetic) but protest when a convicted murderer is to be executed and who want to ensure he dies as painlessly as possible. I thought Neil’s microscope on Reality was a little smudged, so I added the two sets of bold box brackets to temper his emotional plea. I didn’t subtract anything though his wording was a little sloppy joe. For instance, a large percentage of abortions are done 6 weeks or less into gestation so “crushing and dismemberment” might not be the most accurate description for all abortion. I left “innocent” in there because technically speaking, a human fetus lacks the mental requisites to be anything other than harmless…even though being told so is awkwardly redundant. And while “human being” is a poor word choice (it overgeneralizes) when speaking of abortion, an embryo/fetus, though not a person is taxonomically speaking, still a human being. But other than those minor details, he’s talking about people like me! Remember, God thought that the death penalty was ok as some point in time. I thought it was important that readers understand the angle he’s coming from. One could hold a belief in “God” yet remain adequately critical. If one does not claim to “know God” or use “God” to explain phenomena, then the belief on its own poses no difficulties. However, it’s clear that most don’t tread with reservation. Most speculate. The instant any speculation as to the nature of “God” occurs, the speculator rejects reason. Unfortunately, most people who believe in “God” speculate. Whether abstractly (e.g. “God’s will” or “God watches” or “Designer”) or more concretely (e.g. “God had a Son who He sent”), conjecture is common. Such unsubstantiated conjecture is self-gratification often cloaked in piety. Theists should stop speculating while atheists are best not debating the existence of “God” at all. To keep theists in check, we all (theists especially) should question the absurd claims often uttered from the supposition. After all, it’s the absurdities that stir mischief, not an indescribable belief. @petrock – Theory is not a synonym for belief, however, we may choose which theory that we believe ourselves, scientists do it all the time. Scientists discern (i.e. “choose”) based upon evidence. To equate discernment between scientific theories with choosing between supernatural beliefs is an insult to science. @petrock When you start judging the “legitimacy” of a theory — you are by definition interjecting your personal belief system. When a theory is supported by evidence and one continues to test that evidence to see where it leads, this is not a “personal” journey. There’s a reason why scientific communities come together, and it isn’t because they share an “interjected”, “personal” belief. They simply share the urge to discover. On Twitter, I was so taken aback by Vicki’s remarks that I made a rather useless retort wondering if she had been watching too much FOX (one of her favorite sources that has a reputation of having “news” anchors who often use similar reasoning). My apologies. I hope this post helps Vicki see where my thinking is at.